Provoked by Tuesday’s protest by National Assembly workers over non-payment of allowances and benefits, the House of Representatives, yesterday, resolved to invite the Minister of Finance, Mrs Zainab Ahmed, to appear before its Finance Committee to explain the reasons for the non-release of 2018 budgetary allocations to the legislature and the judiciary. 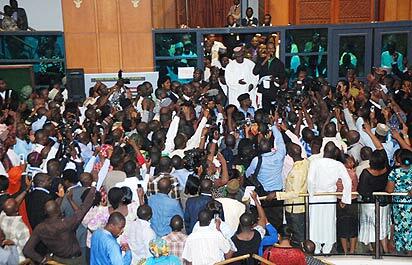 The summon followed a motion sponsored by Edward Pwajok at the plenary, yesterday. Moving the motion, Pwajok expressed worry that both arms of government were placed on first line charge, wondering why the minister was yet to release the funds to enable the management pay the staff. He said the development was responsible for the non-payment of the allowances, which also led to the protest.